In 1977 Michael Clark (born 1954) became a habitue of the Colony Room Club, where he became acquainted with the artist Francis Bacon (1909-1992) and the arts patron Valerie Beston (1922-2005). In the early 1980s Beston suggested that Clark make the first of what became a series of portraits of Bacon, sparking a friendship between the two. Bacon’s work has always been highly influential to Clark, whose style has dark overtones that often echoes that of the older artist. 'Study for Reece Mews, London' (1982-1983) depicts Francis Bacon's studio, which was near the Victoria and Albert Museum. The artist lived and worked in this studio from 1961 until his death. This drawing, and a watercolour of the same subject by Clark now in the collection of the Museum of London (museum number 2000.263), were made when the artist was working on a series of portraits of Francis Bacon. The contents of Bacon's studio were transferred to the Museum of Modern Art in Dublin following the artist's death in 1992. 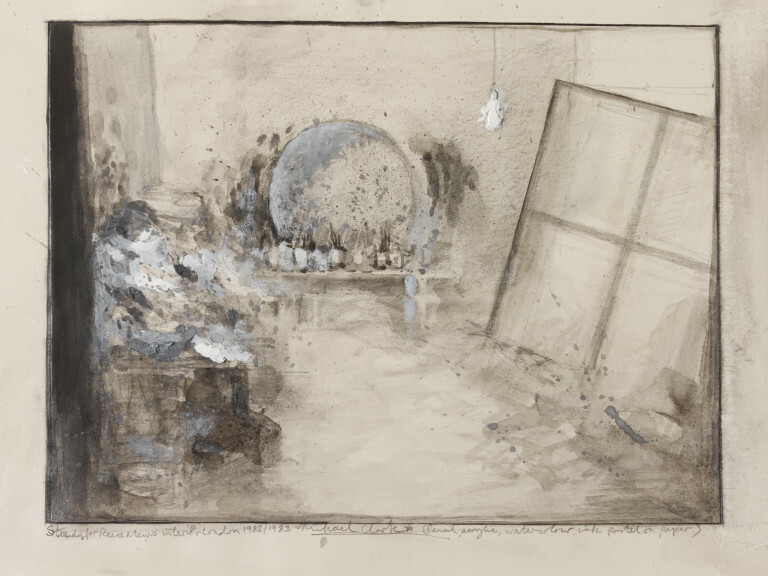 The artist has effectively combined charcoal, pastel and gouache to convey the impression of disarray of Bacon's studio. 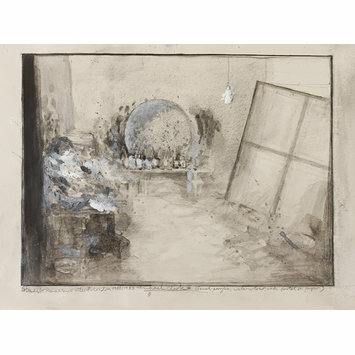 The central circular motif is the grubby mirror which dominated the room, while the pots of paint brushes, depicted in charcoal, merge together in the background and the impasto of the gouache makes the form of the bare light bulb stand out from the clutter of the studio. This drawing therefore offers the viewer an insight into the squalid working milieu of one of the most celebrated British painters of the 20th century. Drawing of the interior of a studio with a chaotic arrangement of paint pots, etc., on the floor, against a wall, in muted colours. Study for Reece Mews interior London. Drawing of the interior of Francis Bacon's studio in Reece Mews, by Michael Clark, 1982-1983. Giles Waterfield, ed. The Artist's Studio London: Hogarth Arts, 2009. ISBN: 978-0-9554063-3-1.